Posted bycarlarjenkins	 January 6, 2017 Leave a comment on This Sunday I’m Throwing an Expand Your Personal Brand Workbook Facebook Party! Phenomena Corporation is starting off 2017 the right way by throwing a party with a purpose. This Sunday, January 8, 2017 at 12 noon EST, we will be partnering with Goddess Fish to host our Expand Your Personal Brand Workbook Facebook Party. Many people’s New Year resolutions revolve around getting a new job. Well, our Expand Your Personal Brand workbook will solve their pain points by providing them with 40 personal branding exercises. The Facebook party will have games and prizes. 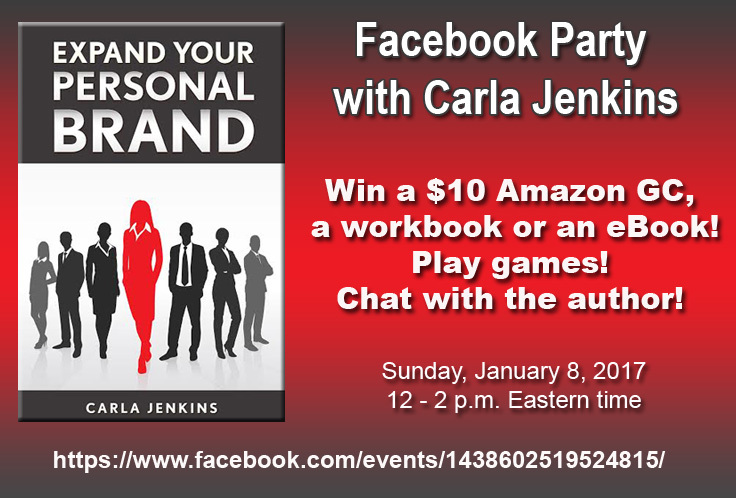 Party goers will have the chance to win Jenkins’ Amazon bestselling Expand Your Personal Brand book, the workbook and a $10 Amazon gift card. Furthermore, they will also get to ask Jenkins about how they can expand their personal brand. And, it is free for all!